Initially a modest shrine dating back to the 12th Dynasty (1991–1778 BC), Karnak surpasses every other pharaonic temple in scale with over 100 acres dedicated to the Egyptian gods. As the empire expanded and gratitude towards Amon deepened, successive pharaohs right down to the time of the Greeks, added pylons, courts, shrines and statues to the magnificent temple complex. The complex consists of seven major temples. The basic features of the temples were laid out by Thutmose I, Hatshepsut and Thutmose III of the 18th Dynasty (1543–1292 BC). However, the most impressive structures are the works of Seti I and his son Ramses II of the 19th Dynasty (1292–1187 BC) who added the Great Hypostyle Hall. Resembling a forest of stone, 134 pillars stand like giant trunks carved with scenes depicting the King worshipping Amon. The 12 pillars in the centre stand 21 meters high and 6.5 meters wide at the top. These are flanked by seven rows of nine pillars each of 13 meters height. A sound and light show is held in the evenings at the complex. The story of Karnak is narrated as visitors first walk through the dramatically lit temple followed by a laser show once the audience is seated behind the Sacred Lake. Whilst the Karnak temple is the work of a multitude of pharaohs over two millennia, the Luxor temple in the heart of Luxor city is the creation of Amenhotep III’s architect Bakrenef (18th Dynasty) and Ramses II (19th Dynasty). Known as the ‘Harem of the South’ it was dedicated to Amon’s wife Mut and her son Khonsu. 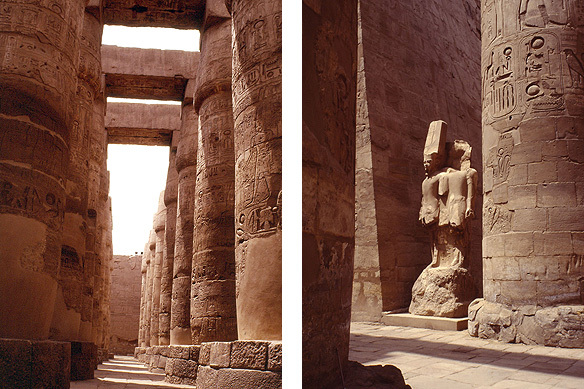 It follows the same style as the Karnak temple, except that it is more elegant and cohesive. With the Luxor temple, Bakrenef perfected the pylon and hypostyle hall, and the complex became the basis for all temples built in the following millennia. 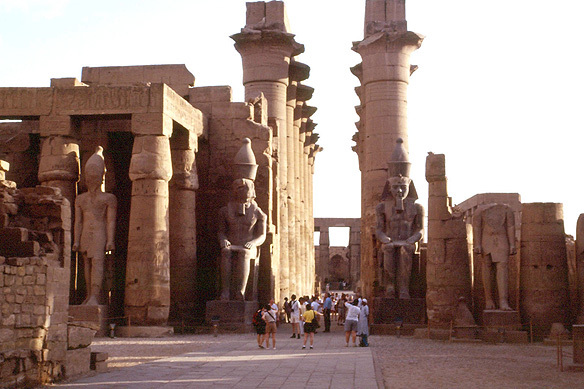 The temples of Luxor and Karnak were once connected by a 3-kilometer long avenue of ram-headed sphinxes of which only a small section remains today. During the annual Opet fertility festival, the statue of Amon was escorted from Karnak on a grand procession to be reunited with his wife Mut at Luxor. A must see on the East Bank is the Luxor Museum of Ancient Egyptian Art. It is an absolute gem with an exquisite collection of statues and artefacts displayed to perfection. As it is opened till late, it can be easily visited in the late evening. The new hall was specially made to house the astounding cache of 26 statues discovered in the Luxor temple in 1989. Amongst the finest are the statues of Amenhotep III, Thutmose III and Ramses II which are completely intact. The West Bank is dry, desolate, isolated; the luminous golden sands of the desert giving way to red sandstone cliffs. Mortuary temples to receive prayers from the faithful, tombs built deep into the cliffs and the workers village—Deir el-Madina—where the artisans who worked on the tombs lived, together made up a city of graves and homes for the dead. As one drives towards the West Bank, one passes the colossal statues of Amenhotep III seated sedately in the midst of sugar-cane fields. Standing 19.5 meters high, these statues once guarded the gate of the mortuary temple of Amenhotep III of which nothing else remains. The right statue was hit by an earthquake in ancient times after which it made a singing sound. 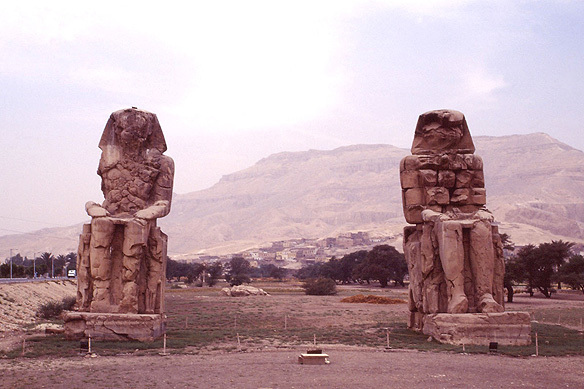 The Greeks believed it was Memnon singing for his mother and named the statues Memnon Colossi. The Romans eventually restored them after which the ‘singing’ stopped. The Mortuary Temple of Hatshepsut at Deir el-Bahri is one of the most beautiful and elegant monuments in the West Bank. Daughter of Thutmose I, Hatshepsut (1508–1458 BC) ruled for 21 years and was Ancient Egypt’s only woman pharaoh. Since she had only two daughters, the next pharaoh in line was Thutmose III, her husband’s son with a harem girl. After her step-brother/ husband Thutmose II’s death, she declared herself pharaoh, started wearing male dress and the royal traditional false beard, and co-ruled with her 10-year old nephew/ stepson. 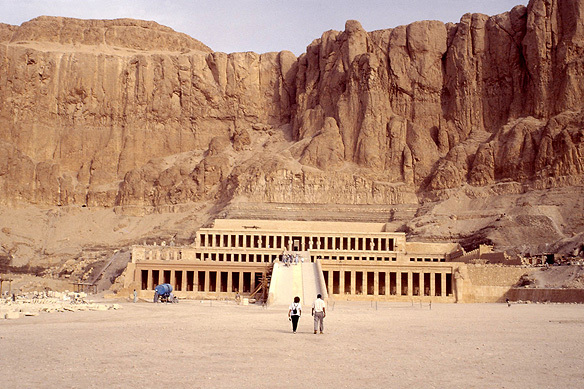 Her magnificent mortuary temple, designed by Senmut, her court favourite, is dramatically set against the Theban hills. Djeser Djeseru, splendour of splendours, as Hatshepsut called it, consists of three broad terraces linked by broad ramps, its many columns carefully integrated with over 190 statues and relief carvings glorifying the queen. Behind each terrace is a portico [covered area with columns], its walls covered with brightly painted relief sculptures illustrating the queen’s divine birth and events in her life, the most remarkable being the expedition she sent to Punt [today Somalia]. The sanctuary where the priests made offerings to the woman pharaoh lies deep inside the cliffs on the third terrace. Upon her death, Thutmose III finally claimed his throne and erased all her cartouches [royal hieroglyphic figures] and portraits in his attempt to wipe out her memory from history. Other mortuary temples that are worth visiting are Madinet Habu, mortuary temple of Ramses III, and Ramesseum, mortuary temple of Ramses II. It is at the Ramesseum that Percy B. Shelley came across the famous statue of Ramses II which inspired his poem Ozymandias. The statue, now broken, was one of the largest free standing monuments in Ancient Egypt, standing 17.5 meters high and weighing over 900 tonnes. Valley of the Kings in the West Bank of Luxor is the burial ground for 28 pharaohs of the New Kingdom (1550-1080 BC). Thutmose I was the first king to be buried here, setting a pattern for the New Kingdom pharaohs. After seeing the plundering of the pyramids and tombs further north, he felt that no place was safe from thieves and chose the secluded Theban hills as his burial ground. However, even the Valley fell prey to thieves in time, and the only tomb to survive was that of the boy-king Tutankhamen, discovered by Howard Carter on 4 November 1922, the treasures of which are on display at the Egyptian Museum in Cairo. The Egyptian religion was based on the concept that death was a continuation of life. The tombs were, thus, homes for the dead, and were lavishly decorated with magical formulas and scenes from the Book of the Dead in bright vivid colours to guide, protect and ensure immortality. The tombs were also generously stocked with necessities and luxuries that the pharaohs would need in their afterlife. Pharaohs usually started work on their tombs immediately after coming to power. The most splendid tombs in the Valley of the Kings are those of Ramses VI, Ramses III, Seti I, Thutmose III and Tutankhamen. Valley of the Queens nearby houses around 70 tombs belonging to the queens, princes and princesses of the New Kingdom. The most remarkable tomb is that of Nefertari, wife of Ramses II, which has been restored to a cost of US$ 6 million. Government officials and high priests were buried in the Valley of the Nobles. Their tombs are interesting for the imagery decorating the walls. Instead of prayers and scenes from the Book of the Dead they depict daily life in Ancient Egypt ranging from harvest, hunting and fishing to funerary banquets and processions. To fully appreciate and enjoy Luxor, one needs to spend at least two days in this ancient city. Most cruises use it as a starting or ending point, to which one can add on the extra day. The historical Sofitel Winter Palace is the place to stay with its wide corridors, high-ceilinged rooms and picture perfect views of the Nile and Theban hills. Alternately, there are plenty of other hotels offering excellent services. This entry was posted in Egypt, Exploring our World and tagged Ancient Egypt, Capital of New Kingdom, Egyptian Antiquities Organization, Egyptian Civilization, Egyptian Gods and Goddesses, Egyptian Mythology, Karnak Temple, Luxor, Luxor Museum of Ancient Egyptian Art, Memnon Colossi, Mortuary Temple of Hatshepsut, Nile Cruise, Ramesseum, Temple of Amenhotep III, Thebes, Things to see in Egypt, Tomb of Nefertari, UNESCO World Heritage Site, Valley of Kings, West Bank by Rama Arya. Bookmark the permalink.